Key 1 3/4" x 50' White "Combat Ready" Fire Hose. 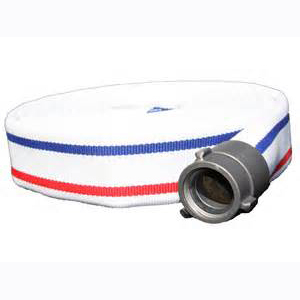 Size: 1.75" Color: White with Red/Blue Stripe Length: 50' Double Jacket Fire Hose with 1000 Pound Test Quality: The fire hose assembly supplied under this specification shall be constructed with superior quality materials. NFPA 1961 standards shall be observed in production of the assembly, in order to ensure its quality and durability. Service Life: Hose furnished under these specifications will have a potential service life warranty of not less than ten years; barring mistreatment that would render it unfit for service. Upon delivery, the hose shall be free from defects in workmanship and materials. Any defective hose will be replaced at no charge. Jacket Construction:The jacket will be woven evenly and be free of defects, including knots, lumps, or unsightly disfigurations that could jeopardize the integrity of the hose assembly. The warp yarn shall consist of staple polyester yarn. The use of filament or entangled yarn is expressly forbidden due to the lack of inherent abrasion resistance. The filler yarns shall be constructed of high strength, low elongation, filament polyester to reduce weight and increase flexibility. Abrasion Impregnation: Hose assemblies are available 1200°F with polymer impregnation that will provide additional abrasion resistance. Colors include: yellow, orange, red, tan, black, blue and green. Color shall be pure and even in each hose. Impregnated hose shall meet the requirements of Mil-H-24606B for abrasion resistance. Lining: The rubber lining (100pphm/118°F/70 shall be a single-ply extruded tube of synthetic EPDM compounded to resist ozone. The finished form shall be free of pits or other imperfections and have a smooth finish. No reclaimed rubber shall be used. Plastic tubes that sacrifice durability of the hose life for the sake of weight are not acceptable. Backing: The backing shall be of adequate thickness to create a smooth waterway but not greater than .020. The fire hose constructed under this specification shall be manufactured fully backed. Tensile Strength & Ultimate Elongation: Shall meet the standards of Underwriters Laboratories, Inc as well as all other properties of UL-19 for rubber lined hoses. A valid U.S. Underwriters inspection procedure shall be in force at the time of bid. We reserve the right to modify any specification without prior notice to meet or exceed changing standards. Please note that special diameters or construction characteristics can be produced on special request.